With a title like A Walk Among the Tombstones, I thought the 2014 film would offer a sappy chick flick ala something from the Nicholas Sparks playbook, perhaps because the title reminded me of A Walk to Remember. I couldn’t have been more incorrect, as A Walk Among the Tombstones instead delivers a gritty crime drama. 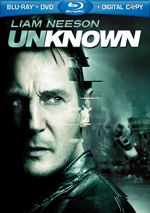 Set in 1999, unlicensed private detective and former cop Matt Scudder (Liam Neeson) meets Kenny Kristo (Dan Stevens) and finds out someone abducted Kenny’s wife Carrie (Razane Jammal) was abducted. Kenny paid the ransom but the kidnappers killed her anyway. Kenny makes his money in illegal drugs, so Scudder declines the assignment. However, when Scudder learns of the brutal manner in which the offenders treated Carrie, he agrees to take the case. We follow his pursuit of the kidnappers and connected twists. If one doesn’t expect those twists, one hasn’t seen many movies of this sort. I won’t divulge any spoilers, but it seems obvious from the start that we’ll find more to the story than we initially believe. The pertinent question becomes how interesting the film makes those inevitable curveballs, and in the case of Walk, the answer is “not very”. While it attempts to spin us and keep us on edge, the tale seems fairly generic and lackluster. Walk embraces far too many contrived notions and doesn’t manage to make any of them interesting. Prime example: the character of TJ (Brian 'Astro' Bradley), a street-smart homeless kid who becomes Scudder’s ally. This entire thread exists a) to humanize Scudder and b) to add potential peril along the way. The film needs neither side so the TJ thread seems come across as mawkish and phony. Of course, the backstory related to why Scudder left the police force falls into the same category, as does the choice to place him in Alcoholics Anonymous. All of these elements populate the movie to add a supposed human element to the proceedings, but they simply feel forced and artificial. At times Walk aspires to offer a dark, hard-edged tale, but these soft scenes rob it of such tension. Walk also shows a reluctance to take the graphic nature of the story to its natural conclusion. It could’ve used a more direct filmmaker like David Fincher to allow it to live up to its potential. Instead, Walk wants to believe it’s stark and edgy but it smooths off too many rough corners to be the horror show it should become. At least Neeson does fairly well in the lead role. Nothing about Scudder forces him to break a sweat, but he provides a more substantial performance than the part probably deserves. In the end, the trite character/story elements and the lack of grit behind Walk make it less than enthralling. It comes with the right ingredients to deliver a visceral thriller but falls into to many clichés to prosper. A Walk Among the Tombstones appears in an aspect ratio of approximately 2.40:1 on this Blu-ray Disc. The image satisfied. Like most modern thrillers, Walk went with a stylized palette. Much of the flick stayed with a pretty desaturated set of tones that focused on an amber or gray tone. Within those constraints, the hues were appropriate and well-rendered. Blacks seemed dark and tight, while shadows showed good clarity. This became a solid “A-” presentation. I also felt pleased with the DTS-HD MA 5.1 soundtrack of Walk. The soundfield mostly came to life during a few action sequences, as those provided fairly good material from the side and rear speakers. Scenes in clubs and bars also added life. Otherwise this was a mix heavy on atmosphere. Those elements created a nice sense of place and added impact to the material. Two featurettes appear here. 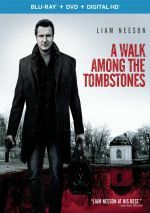 A Look Behind the Tombstones runs 12 minutes, seven seconds and includes notes from screenwriter/director Scott Frank, producers Tobin Armbrust, Michael Shamberg and Stacey Sher, and actors Liam Neeson, Dan Stevens, Boyd Holbrook, Brian “Astro” Bradley and David Harbour. “Look” examines story/characters, cast and performances as well as shooting in New York City. It presents a standard promotional piece without substance. Matt Scudder: Private Eye lasts six minutes, 26 seconds and delivers notes from Frank, Sher, Armbrust, Neeson, Shamberg and author Lawrence Block. This one covers the source novel and its adaptation for the screen as well as character/narrative topics. Like “Look”, this ends up as another fluffy show. The disc opens with ads for Dominion, Scorpion King 4: Quest for Power, Nightcrawler, The Guest, Dragonheart 3: The Sorcerer’s Curse, Dracula Untold, The Man with the Iron Fists 2 and Ouija. No trailer for Walk appears here. A DVD copy of Walk also pops up here. It features “Look” but lacks “Scudder”. A Walk Among the Tombstones occasionally threatens to turn into an engaging thriller, but it suffers from too many clichés to prosper. 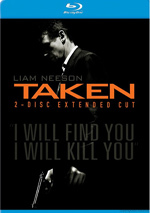 Although a good lead performance from Liam Neeson helps, it comes with too many trite moments to succeed. The Blu-ray provides solid picture and audio but lacks substantial bonus materials. I don’t dislike Walk but I can’t say it does much for me.